There's nothing like Australia's magnificent Great Barrier Reef and its tropical rainforests which are bursting with thousands of marine, plant, bird and animal species, of which many are unique to Australia. This fabulous two week adventure takes you to experience both the reef and the rainforest. 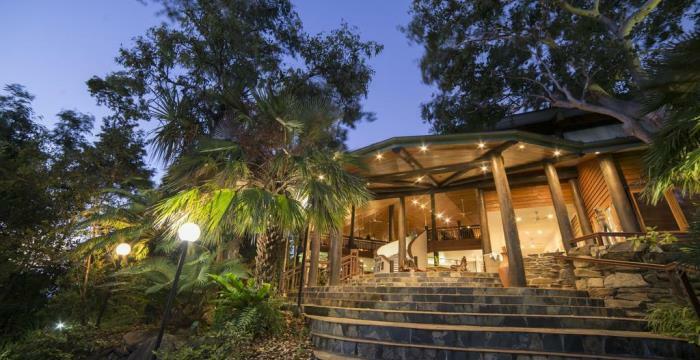 Start with 5 nights at the Thala Beach Lodge in Port Douglas. This is the ideal deal base for exploring the Great Barrier Reef and its magnificent marine life. From here you'll pick up your car and embark on a self drive adventure which takes in Cape Tribulation, Daintree National Park, the Atherton Tablelands and Mission Beach before finishing in Cairns. Sail on a catamaran from Cairns wharf to spend 3 further nights enjoying the reef on Green Island Resort. On this wonderful tour of northern Queensland you begin and end in the tropical city of Cairns and in between drive to Cape Tribulation, the Atherton Tablelands and Mission Beach. Along the way you can explore steamy rain forests, relax on golden sand beaches, try an adventure trip on a raging river and learn about the fascinating history of this colourful region of Australia. You will drive yourself so it is up to you how much time you spend at any one destination before moving on. Pick up your Avis rental car in downtown Cairns or at the city airport and drive north to Cape Tribulation. Travel along the Captain Cook Highway perhaps stopping for lunch at Port Douglas. Pass through the town of Mossman and then cross the Daintree River by ferry continuing to Cape Tribulation where you stay overnight. Today head south crossing the Daintree River again then take the turn-off to Mareeba along the picturesque Developmental Road, passing through Mount Molloy, Mareeba and on to Yungaburra. Atherton is the 'capital' of the Tropical Tablelands, a land of beautiful lakes, waterfalls, rich red soil and tropical rain forest. Here the temperature is cooler, the pace is slower and there is a feeling of relaxation in the air. Today is free to explore the Atherton Tablelands and its surrounds. Take the four mile track around Lake Eacham, pausing to view the two giant kauris. Some of the many animals that inhabit the park, including the colourful Boyd's forest dragon, amethystine python and eastern water dragon, can sometimes be seen from the track. Lake cruises operate from the tea house. Head off early towards Innisfail, taking a short stop at Millaa Millaa Falls on the way. Continue south to Mission Beach. Hugging the coast for about 11 miles. Mission Beach takes in a handful of villages and is a relaxed, yet vibrant beachfront town with more than 11 miles of magnificent golden sandy beaches. Here two World Heritage areas, The Great Barrier Reef and Wet Tropics Rain forest, come together to form a tropical paradise. With all that rain, the nearby Tully River is one of the best places in Australia to go white water rafting. Spend a day relaxing in Mission Beach or experience the thrill of white water rafting on the Tully River. Rafting companies operate daily and provide transfers from Mission Beach . The nearby Misty Mountains Trails will challenge even the best bush walker or you can just stay put and relax on the beach or take a trip out to one of the great Barrier Reef islands. Leave Mission Beach today via the Bruce Highway and head towards Cairns stopping at the town of Innisfail. Another interesting stop is at the Johnstone River Crocodile Farm at Flying Fish Point. Your tour comes to an end today but there may be time for some last minute shopping or sightseeing in Cairns before you take your car back and head for the airport for your onward flight or journey home. If you fancy a true rain forest experience this short tour of Cape Tribulation and Daintree National Parks is a must. Over two days you can immerse yourself in this World Heritage area stopping at spectacular gorges, crossing raging rivers and trying aerial walkways. You will stay for a night in the forest and can venture out of your hotel with a guide for a memorable nocturnal walk. Australians love a good adventure tour, and they don't come much better than this. There's no better place in the world to learn to dive, then put your new found skills to the test, than Australia's stunning Great Barrier Reef. On this five day break, which begins and ends in the tropical city of Cairns, you will spend two days scuba diving training at a diving centre pool. Then it's off to the Barrier Reef for three days of action when you can qualify as an open water diver while completing a series of descents on the spectacular reef. On this exciting three night tour from Cairns you are taken to some of the Southern Great Barrier Reef’s most colourful areas. From the mangrove channel at Hinchinbrook Island to the ancient rainforest of Dunk Island, and the untouched remoteness of Sudbury Cay, you experience a myriad habitats, on land and at sea. The itinerary has been designed to provide time to explore the Reef through snorkelling, scuba diving and glass bottom boat tours and includes a visit to the Turtle Rehabilitation Centre on Fitzroy Island. And when you’ve had your fill of exploring, enjoy sunset drinks and sumptuous seafood buffets onboard you boat. You will live like a king on this wonderful nine day tour of the stunning coast of Queensland. Leaving Brisbane you follow the coastal highway north to Cairns visiting great towns, national parks and having time to relax on some of the islands of the Great Barrier Reef. There are so many sights to see on your journey, but there will be time to relax on beautiful beaches along the way and see some of the fascinating marine life. So have a whale of a time on the Queensland coast. You can swim, snorkel, dive and sail the World Heritage-listed Great Barrier Reef, the living masterpiece that's so big it can be seen from outer space. It stretches more than 2,000 kilometres along the Queensland coast, from the mainland towns of Port Douglas to Bundaberg. On this five day cruise you hop between the pristine, palm-fringed islands on top, then explore the rainbow-coloured coral islands and marine life below. This 14-day self-drive tour is a great way to explore Queensland's cities and reefs at your own pace. Starting off in Cairns, you'll take in glorious beaches, lush rainforests and sugarcane plantations and Fraser Island, renowned for its beauty, before arriving in Brisbane. The perfect blend of memorable sightseeing with plenty of time to relax, this 10-day tour starts out in Brisbane and heads north to Cairns, along the way taking in lush rainforests, pristine beaches, and, of course, the unforgettable Great Barrier Reef. You’ll meet the koalas at Australia Zoo, take a cruise to Whitehaven Beach, voted Australia’s best beach, enjoy delicious local cuisine, and tour the cities of Brisbane and Cairns, as well as having plenty of time at leisure for snorkelling, swimming and sunbathing.